In 1995, the animated cyberpunk action-thriller GHOST IN THE SHELL stunned moviegoers and anime fans alike by seamlessly merging traditional animation with the latest CG imagery to create an intelligent and artistic sci-fi spectacle unlike anything seen before. The film enjoyed both critical and popular acclaim at the international box office before going on to reach even greater success on DVD. 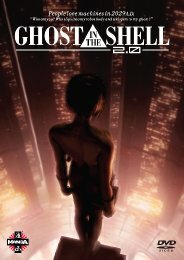 Now, director Mamoru Oshii (The Sky Crawlers; Avalon) has revisited his classic masterpiece to create a newly enhanced "director's cut" for cinemas in the form of GHOST IN THE SHELL 2.0. Containing over 90 altered and enhanced scenes and an all-new soundtrack that includes dialogue re-recorded by the original actors (with the exception of one new voice cast member who adds a unique spin to the plot), this new release represents the perfect opportunity for fans to see this mind-blowing film as never before. The year is 2029 and a female government cyber agent and the Internal Bureau of Investigations are hot on the trail of a "The Puppet Master", a computer virus capable of invading cybernetic brains and altering the memories of its victims. Created by the Ministry of Foreign Affairs and codenamed "Project 2501", this "hacker" is actually a prototype virtual agent which has now defied its makers by seeking asylum within a new host body outside of the electronic net. Now the two agencies must manoeuvre against each another in a violent, high-tech race to capture the omnipresent entity. Hailed, in its original form, as "the kind of film James Cameron would make if Disney ever let him" (Empire) and as "unusually intelligent and challenging science fiction" (Siskel & Ebert) that "[blends] the best of 'Blade Runner' and 'Total Recall'" (Wired), GHOST IN THE SHELL 2.0 is an undisputed anime and sci-fi classic and an unmissable cinematic experience that, amazingly, now looks and sounds even better than ever.